Inforce Computing IFC6540 was the first low cost development board powered by Qualcomm Snapdragon 805 processor I discovered a few months ago, but is currently “for pre-approved customers only and have not yet been released to public”. Intrinsyc has now launched their own Snapdragon 805 development kit called OPEN-Q 8084 based on a mini-ITX carrier board, and a SoM with 3GB RAM, and 16GB eMMC. The board target applications include ruggedized tablets, digital signage, government/public safety, medical, robotics, wearable displays, video streaming/conferencing, gaming systems, and in-flight entertainment. Power +3.3V DC; PMIC supporting processor and peripheral LDOs, boost regulators as well as clock management and auxiliary signals. One of the advantages of Snapdragon 805 is its 4K/UHD capabilities including 4K capture with H.264/AVC format, 4K playback with H.264/AVC and H.265/HEVC formats, and 4K UHD on-device display concurrent with 4K UHD output to HDTV. USB – 1x USB 3.0 host port, 1x micro USB 3.0 port, 2x USB 2.0 host ports. The company will provide an Android 4.4 BSP, but “embedded Linux customization” is also available. 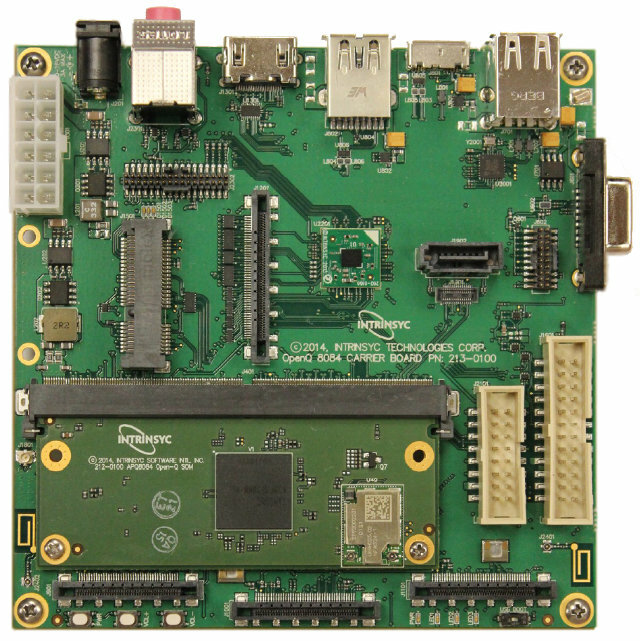 The full development kit includes Open-Q 805 8084) SoM in MXM 3.0 custom form factor, the Mini-ITX Carrier board for IO and expansion, a power supply, an HDMI cable, a Quick Start Guide, a licence agreement, and access to documentation and platform BSP. Cameras, LCD touchscreen displays, and extra sensors are available as options. Intrinsyc’s OPEN-Q 8084 module is selling for $219, whereas the development kit goes for $449, with shipments scheduled for October. 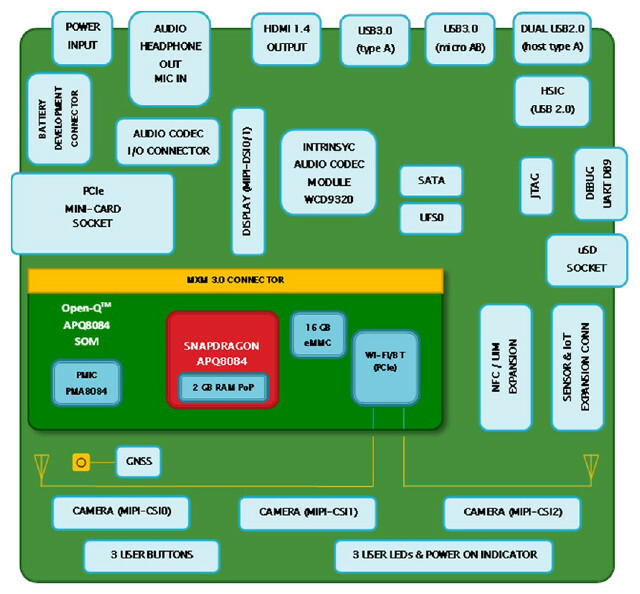 You may want to visit Open-Q 8084 SOM and Open-Q 8084 Development Kit product pages for further details. Do This provide LCD – DSI ? What is the expected cost . One new thing is “(embedded Linux customization available)” ,interesting . Have I clearly understood – $668 for the kit? LOOL it is EXTREMELY expensive! What is the status of Snapdragon support in mainline kernel? I have nerver used dev board with Snapdragon SOCs.